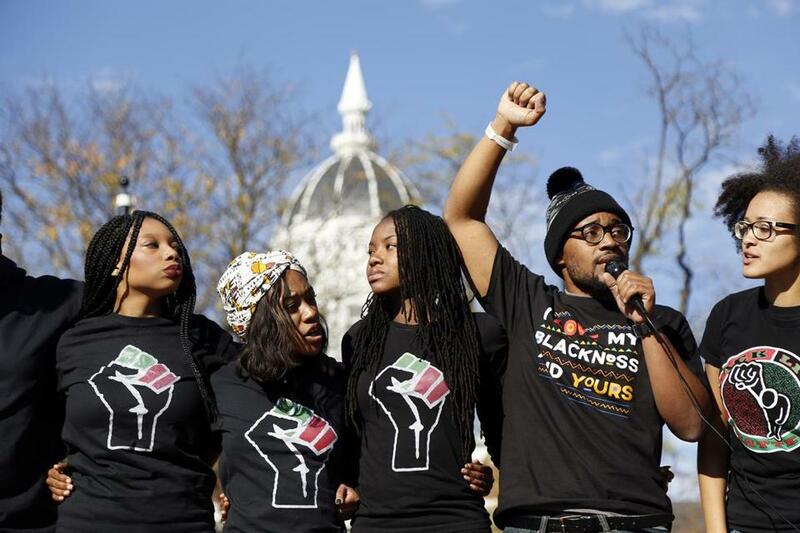 University of Missouri graduate student Jonathan Butler (second from right) spoke following the announcement that President Tim Wolfe would resign Nov. 9 amid student protests over his handling of racial tensions at the school. While the world has been gripped by epoch-making events — from jihadist massacres in Paris to downed warplanes in Syria — American universities have been gripped by events that are better described as emoji-making. Like the emoticon with the smile and the tears, I cannot decide if these events make me want to laugh or cry. Since the wave of student protests began, commentators whose own degrees are date-stamped from the 1980s have been scratching their heads. Are the protesters “little Robespierres,” thirsting to tear up the constitutional guarantee of free speech? Are they pathetic products of lifelong mollycoddling, who just can’t cope with challenging ideas? 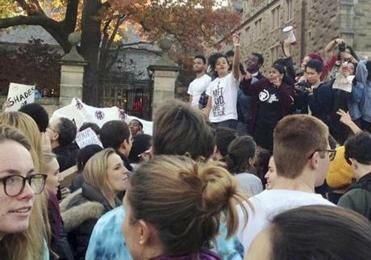 Or are they simply the heirs of the generation of 1968, the original campus revolutionaries? I can almost see the nostalgia in the faces of some of my older colleagues. “Fifty years ago,” they are saying to themselves, “that would have been me staging a sit-in at the dean’s office.” As opposed to sitting in it every day from Monday to Friday, 9 to 5, which is what they do now. Having already achieved a reasonable goal — of enlisting administrators who are enthusiastic about diversity — protesters at Yale and elsewhere have moved on to an unrealistic one. Read: 2014: Are our students ready for college? Baby boomers beware. Survey data suggest that Stanley’s students probably are a good deal less committed to free speech than he is. According to a recent Pew survey, 40 percent of American millennials (those aged between 18 and 34) favor government censorship of offensive statements about minorities, compared with 25 percent of those aged 51 to 69. There is another difference between 2015 and 1968. Most of the ire of the campus hippies was directed against the Vietnam War; there were few race riots at Berkeley or Columbia, because nearly all the students there were white. That has changed. So is what we are seeing an effort by African-American students to broaden the Black Lives Matter campaign, which began in response to a series of allegedly racist killings? Certainly, the demands of the student protesters are designed to address a supposedly analagous problem of institutional racism. It took me a while to realize where I had encountered this style of argument before — the indignant repudiation of the questioner’s request for proof as something in and of itself illegitimate. This is not political language at all. It is religious language — and it reads in places like the reincarnation of the tracts that 17th-century Puritans used to publish. With their craving for “safe spaces,” their revulsion against rational discussion (not to mention Halloween), their fundamentally illiberal and indeed irrational state of mind, the protesters strike me not as “little Robespierres” but as the natural heirs of the Puritans who founded the British colonies in New England. How appropriate that the protests should reach their climax just in time for Thanksgiving, when Americans celebrate the Puritans’ first good harvest at Plymouth! Now, what’s the right emoticon for “Back to the real world”?